interesting and interactive. Discovering Computers 2003 is fully integrated with the World Wide Web as a means of offering additional content, unmatched currency, learning games, and more. 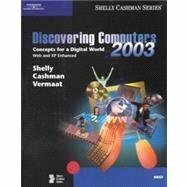 Discovering Computers 2003 is available in three versions to provide the right depth of coverage for every class. Unparalleled online content, extensive end-of-chapter exercises, and comprehensive instructor's resources give you all the tools you need to present an outstanding concepts course.